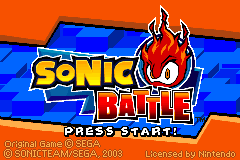 Sonic Battle is a surprisingly good Sonic fighting game for the GBA, most notable for featuring 3D battle arenas (on the Game Boy Advance!) and Emerl. All versions of the game have a language option in the Options menu. However, the English script in the Japanese version has a few differences absent from the other versions, which came out later to coincide with the release of Sonic Heroes. "Holy Summit" is misspelled as "Holly Summit". Rouge's response to encountering password-protected data during her storyline was toned down in the international version. This page was last modified on 16 November 2018, at 13:15.